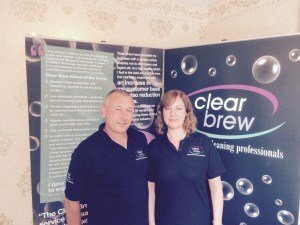 CORNWALL-BASED Clear Brew Limited,established nine years ago by Managing Director Stephen Trezona, has extended its beer-line cleaning services into the Suffolk area. “We offer our services to the licensed trade and catering industry, including pubs, social clubs, sports clubs, holiday parks and hotels – in fact anywhere that has a traditional bar!” Mr Trezona told The Publicans Morning Advertiser. The new business will be run by Husband and wife team Mark and Alison who will commence operations on Monday the 6th of July. ar Brew can add real value to their business. “Both Mark and Alison bring great customer service skills, a hands-on approach and a downto-earth attitude to their work and having just completed and passed our intensive training course with distinction they are now our 26th owner/operators of this highly successful franchised model which offers an essential repeat service that is second to none” says Mr Trezona. Clear Brew’s tried and tested methods can save the customer thousands of pounds by significantly reducing wastage (ullage), water and time by moving to a cost-effective cleaning regime improving product quality in the process. “Our equipment, materials and techniques combine to offer a professional, energy saving service performed by highly trained technicians that ensures the perfect pint – first time, every time” added Mr Trezona.